On April 26th 1986 the nuclear reactor at Chernobyl fractured after an explosion. The surrounding area was evacuated and an exclusion zone was created that remains to this day. The radiation cloud generated spread throughout Europe and a second even more devastating explosion was narrowly averted. The eventual death-toll from cancer and illness related to the disaster is thought to be in the thousands. After flying in from London I stayed the night in Kiev at the Ukraine Hotel which overlooks In dependence square which was the center of the Orange revolution in 2011. Over a hundred people died on the surrounding streets and there are candles and memorial pictures dotted throughout the area to commemorate where they fell. At the time I was there the Ukraine was fighting a war with Russia in the west of the country and a few weeks previous to my arrival someone had tossed a grenade into a crowd of demonstrators protesting at the nearby city hall, killing a police officer. There was definitely an atmosphere of unrest in the air. There are several companies’ running Chernobyl tours from Kiev varying in length from half a day up to 5 days. 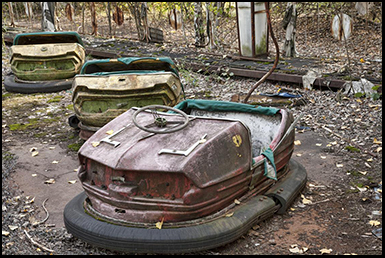 A few of them will also visit the areas around Chernobyl which include abandoned military installations or the former top secret radar station. I had booked a two day trip which left from near the central train station. I took my backpack full of camera equipment and set off at 7 am to arrive at the meeting point where the tour departed at 8. There were around 10 people on the tour plus the guide and the driver. We all piled into a small white mini-van and set off to Chernobyl which is about 130 km’s away. The other people on the tour included a German, an America, a couple of New Zealanders, two guys from Finland, a few from Holland and another person from the U.K. From Kiev to Chernobyl takes around 2 hours until you reach what is referred to as the 30 km exclusion zone. Although it’s the end of September it’s incredibly hot which I didn’t expect in the Ukraine at this time of the year. You are advised to wear a long sleeved shirt as a safety precaution, not only to protect against radiation but once you inside the derelict buildings there are all sorts of hazardous materials from rusty nails to broken glass. Part of the tour included the option to rent a Geiger counter. You are repeatedly told that venturing into the zone is perfectly safe. But I highly doubt that the Ukrainian standards of health and safety are the same as those as other countries. When you register you have to sign an extensive waiver exempting the tour company from any injuries you may incur so you’re really entering the exclusion zone at your own risk. On the way to our destination we watch a documentary on the vans monitor called The Battle for Chernobyl, which I highly recommend. It really increases your expectations to know that very soon you will be at the same location that such a monumental disaster occurred, it also makes you reflect on the hundreds of fireman and soldiers that anonymously sacrificed their lives to prevent an even bigger disaster. Once you leave the outskirts of Kiev you gradually enter the Ukrainian countryside and the roads get rougher and narrower. Then after another hour you start to see signs referring to the 30 km exclusion zone and eventually you come to a military checkpoint. Everyone has to get off the bus and have their passports verified before we can proceed. The nuclear reactor in Chernobyl is still active, and if there was a terrorist attack on the core the resulting explosion would still be catastrophic. Once inside the zone it’s not long before we make our first stop. The mini-bus parks by the side of the road and we all get out. Hidden behind the undergrowth is what was once a children’s home. The building itself is a single story white building, but although it is still structurally sound the paint is starting to peel and the window frames have begun to rot. Inside there are several children’s cots and a few rusty beds. There are also some dolls lined up along the window cell. This building was abandoned over 30 years ago and you can’t help but wonder what happened to its former occupants. Did they get out unscathed or like so many did they eventually die of radiation poisoning ? Although we have been told that the radiation levels are safe there is an area beside the path outside where if you hold a Geiger counter above it, whatever is beneath will send the needle high up the scale. Throughout the entire exclusion zone many radio-active items including military equipment has been buried in the ground rather then removed. After about 15 minutes we all clambered back onto the mini-bus and a few minutes later we stopped at the junction that leads to the town of Pripyat. Here there is the famous art-deco sign with the town’s name on it. Everyone takes a few pictures in front of it and then we head on down the road past the Chernobyl Hotel where we will be staying the night. Nearby is a long memorial walkway with the names of some of Chernobyl’s dead displayed on white signs on either side of it. Although we are now well within the 30 km exclusion zone there are people that now live here full time, many of them are base workers that are building the new protective shield over the reactor. There is also a shop, and without doubt much of its business comes from tourists. Next we head on over to the fireman’s memorial which is an elaborate statue right in front of the Chernobyl fire station, and next to it are some of the original vehicles used in fighting the disaster including a bulldozer. From here it is about a 10 minute journey before we get our first glimpse of the nuclear reactor. We followed the course of the river that runs along the side of the road and then pulled over to take some pictures. Even from a distance the structure seems vast, beside it you can see the huge arch of the new concrete sarcophagus being readied to be slid over the old one. To the right are the remains of a massive concrete chimney which is reactor no 3. This was being built before the meltdown occurred, but now it will be left unfinished. We got back in the mini-van and continued directly up the road and past the main reactor. As soon as we drew level with it every one of our Geiger counters started going off simultaneously and everyone in the vehicle went silent. 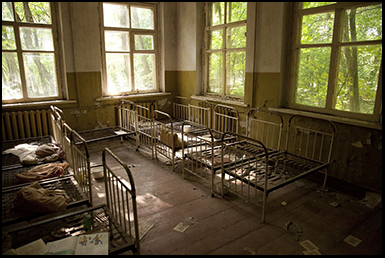 There are parts of Chernobyl where the radiation levels will always be much higher than others, and it is not permitted to stay in the area around the reactor for prolonged periods of time without special protective clothing. But as you pass by you can’t help but look up to the remains of the roof and remember the fireman and soldiers that died trying to prevent what could have been one of the biggest disasters the world has ever witnessed. Keep in mind that then people knew very little about the effects of radiation and the equipment used and protection offered would not have been acceptable by today’s standards. Next we backtracked into the now abandoned town of Pripyat. There is a very short distance between it and the reactor and its close proximity would have allowed little time for escape when the explosion occurred. On the way there we were shown a short promotional film about the town on the vans monitor. It showcased a communist era state of the art community complete with schools, a swimming pool, hospitals, a fire station, shops and dozens of white pristine tower blocks where the base workers lived. Now after 40 years nature has taken over and the city has fallen into decay. Attempts to clean it of radiation have long since been abandoned. Entering the buildings is now extremely hazardous and would not be deemed suitable for tourists in most western countries, and it seems highly likely that at some point that tours will be stopped altogether. It is impossible to comprehend the size of the city from the ground as trees and overgrown hedgerows block your visibility. 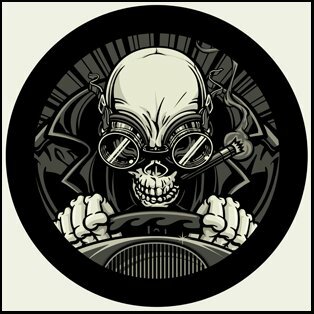 The roads are full of cracks and pot holes and the van shudders as it heads along the narrow streets. From the outside most of the buildings look the same. They are functional white towers of various sizes whose exteriors have long faded. The paint has now dulled and many of the windows are broken. The first building we entered was once a school. It’s several story’s high with concrete stairwells at each end. The guide told us that we could only go to the 1st and 2nd levels as the floors above have already started to collapse. But we are free to room around the long empty corridors. 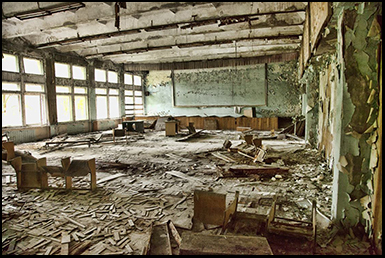 In many of the class rooms there are still chairs, desks and discarded books left as they were over 40 years ago. 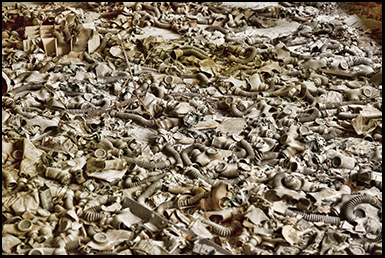 There is also one room which has dozens of gas masks lying on the floor. 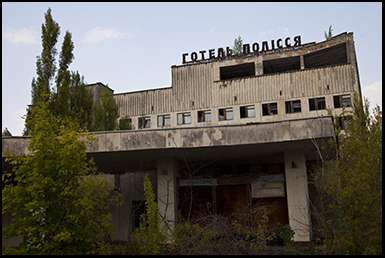 Most of the more valuable fixtures such as the piping and lighting were stolen after the city was first closed and sold as scrap despite being contaminated with radiation. There is broken glass everywhere and you do wonder if these buildings also contain asbestos in addition to radioactive dust. We explored the building for about ½ an hour and then headed back into the van before visiting several other nearby locations including the city’s hospital where some of the firefighters that tackled the disaster died. There are literally hundreds of disused buildings within a few square miles. 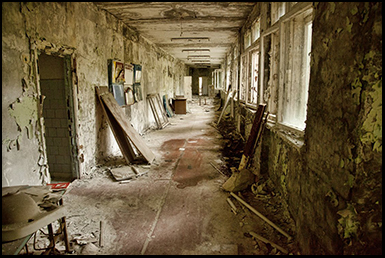 While there are other locations I have been too such as abandoned asylums in the U.S that are extensive in size, in terms of sheer scale Chernobyl must be unique. As we headed towards the remains of the Olympic sized swimming pool we passed another tour group, and at any one time there can be several of them. 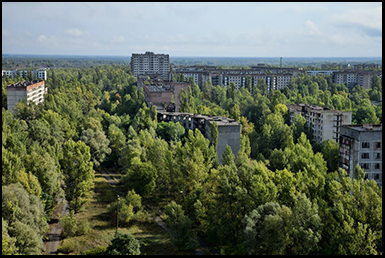 But Pripyat is large enough that the vast majority of the time you don’t run into anyone else and you can appreciate the isolation. Once inside the huge concrete shell of the leisure complex you can see what an impressive place this once was. The diving boards are still intact as are the elaborate stained glass windows. Outside to the rear there is a river that passes by, and in the distance you can see a house boat slowly sinking beneath the surface. We have one more stop on the tour that day and that involves making our way to the top of one of the tower blocks where many of the power plant workers once lived. The day is still sweltering hot, and it’s a 16 story climb. Officially you are no longer supposed to go in any of the buildings but unofficially, clearly everyone does. As far as I know there has never been a death or serious injury during a tour, or if there was it hasn’t been widely reported. But I should imagine one day this will change as the buildings become increasingly more unstable. The tour companies have to pay a significant fee to be able to bring people into the exclusion zone and that would be a major source of revenue that would no longer go to the authorities or the local hotel and shops if it stopped. So it’s in everyone’s best interests to have these tours continue regardless of the safety aspects. I have 2 heavy SLR cameras draped around me as I begin the climb and by this time I have also run out of water. Many of the windows in the stairwells are now missing and the higher you get the more lethal the drop. As we got about halfway up we stopped and made are way around one of the floors. Inside there were a series of small apartments, some with balconies. There were also beds, bits of furniture and old newspapers left behind when the inhabitants were evacuated over 40 years ago. At the time they were told by the authorities that they would be allowed to return to their homes within a few days, but this of course never happened. We headed on upwards, and finally we get to the roof. You have to climb through a hatch to get outside and you are advised to avoid placing any personal items on the ground to avoid prolonged contact with any possible radioactive particles. I was the last one up, I handed my cameras to the tour guide and crawled on through the small opening. 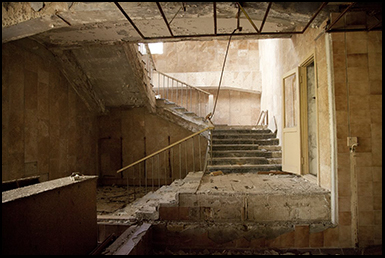 You are advised to keep to one section of the roof and not venture to the other side, which is one more indicator of the decaying state of the building. However there are spectacular views from the front, and below and for the first time you can see how expansive the city below you is. When you are driving along the narrow roads among the trees it’s impossible to tell. But there are dozens and dozens of white apartment buildings trailing off into the distance, and on the far right hand side you can see the nuclear reactor. It’s now that you can really see how close it is to the city. 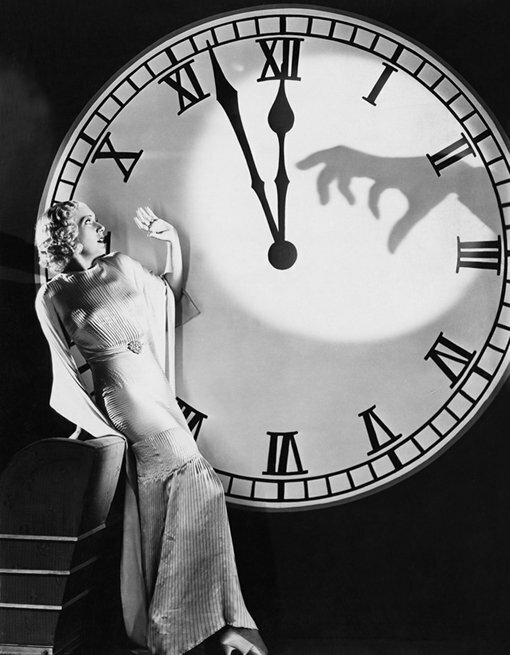 Tens of thousands of people were living and working almost within its shadow. Beyond the city there is also a lake and you can now see that the town is surrounded by forests and extremely remote. We stayed on the roof for about twenty minutes and then made our way back down to ground level. The first day had come to an end and we headed back to the Chernobyl Hotel which is the only hotel in the area. Its basic accommodation but perfectly adequate. However one of the rules we have to abide by within the exclusion zone, is that we are not allowed to venture anywhere without being accompanied by an official guide. So we had a dinner and a few drinks at the bar and then remained in the hotel for the night. We set off early on the second day and the first stop was the uncompleted 3rd reactor. It’s not far from the still active reactor number 1. To reach it we have to get off the van and make our way several hundred yards along a disused train track. Then there is a short walk across a debris strewn field until right in front of you is a massive concrete chimney with an uncompleted base that allows you access between its steel support beams. It’s a long way up to the circular opening at the top and as you gaze skywards it’s like looking through the mouth of a tunnel around 10 stories above. It was fortunate that this reactor wasn’t completed when the main one blew as the damage done could have been far greater. 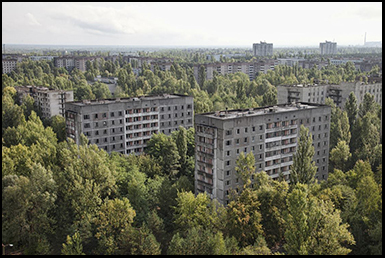 I would assume because of its construction it will still be standing long after the apartment buildings in Pripyat have crumbled. We head back down the rail road tracks to the mini-van and then it’s about a fifteen minute drive until we disembark at what was once the town’s police and fire station. Like everywhere else the area around it is overgrown but the buildings seem to be holding up to the elements better than most. Behind the fire station is what looks like a practice tower for the fireman to hold drills and then directly across on the other side of the courtyard are the servicing bays where the engines were once parked. Hidden among the bushes there are several vehicles including earth moving equipment and a truck. Adjacent to the fire station is the police station. Here you can wander through a long dark corridor which contains the still intact holding cells. You can smell the damp from the water seeping in through the cracks in the roof and there is graffiti on the thick concrete walls. Our next stop is several miles outside of Chernobyl and at one time it was top secret. It’s a military radar station that was in use during the cold war and designed to detect incoming enemy missiles. Its original cost was in the region of 8 Billion dollars but as soon as the reactor blew it had to be abandoned. It is deep in the middle of a forest at the end of a long single track road. As would be expected of a top secret installation there are no signs to indicate its presence. The mini-bus comes to a stop and there is a manned checkpoint that you have to pass through. Then it’s a 10 minute walk through the trees and there is a vast expanse of land where the radar antenna stands. It’s so long you can’t see the end of it and it looms above you several hundred feet. It’s not what you would come to expect a traditional radar may look like. It’s a series of vertical iron towers each connected to each other by thick wire coils strung between them. But despite it being abandoned for so long it looks to be fairly stable and rust free. Each connecting tower has an inspection ladder that you can climb up several levels. It took about 15 minutes to walk to the far the end of the antenna. Behind it is a low grey concrete building about the length of a cruise liner which used to be the radar stations control center. After it was closed down all the electronic equipment and secret documents were removed so now it’s just a shell. Outside there are all sorts of discarded machinery parts and decaying equipment. 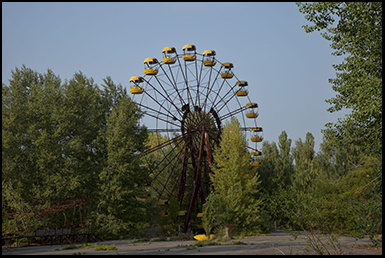 Soon we are headed back to Pripyat, we go directly to the town’s main plaza which was once the center of this once thriving community. This is the location of the former Ministry of Nuclear Power, the Hotel Polissya and the Palace of Culture. Nearby is an abandoned amusement park. There are dodgems, a ferris wheel and a round-about all beginning to rust but still one of the most colorful features in the city which is now a predominantly faded white. When the reactor exploded the amusement park had just been built but because everyone was evacuated before it opened it was never used. On the way to our final destination on the tour we stopped near the river that runs close by the damaged reactor. Although it’s most well known for being the site of a nuclear disaster Chernobyl is now renowned for its wildlife as there are few humans to interfere with the eco system. We were all given loafs of bread and then we walked out across a bridge next to where the mini-van had stopped. As we started throwing the crumbs into the river within a few seconds dozens of gigantic cat fish appeared and started gobbling it up. Did the radiation make them mutate and cause them to grow to be far bigger than normal cat fish, I have no idea. But it’s more likely that it’s due to them having less natural predators and more available resources then most fish in other parts of the country. The last stop involved visiting the home of one of the few people that didn’t actually leave when the reactor exploded. This isn’t near the center of Chernobyl but on the outskirts of the city. We set off in the mini-van and about half an hour later we disembarked and began to walk down what was once just an ordinary suburban street, but now looks like a dirt track through the woods. On either side are small single story houses that no one has lived in for decades. At the very end as the road curves through the trees it comes to a stop and there is another house with a small garden. However unlike the others this appears to be inhabited. The guide goes ahead of us and knocks on the door. An elderly women that is probably in her 80’s appears and starts chatting with everyone. There is no longer any electricity at the house and it’s heated by a wood-burning stove. At one time she did have several neighbors but over the years they had either died or moved away. However she gets regular visits from the numerous tour groups that pass through the area, and the guides usually give her gifts of food. She also has a few dogs for company and apparently she is able bodied enough to walk into town when she needs to. 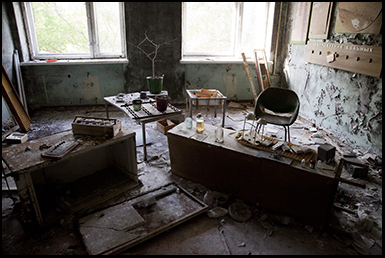 Hey Buddy!, I found this information for you: "Chernobyl – Nuclear Disaster – Pripyat". 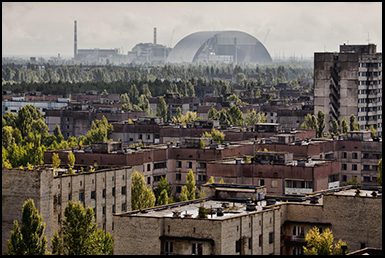 Here is the website link: https://www.chasingmidnight.com/chernobyl-nuclear-disaster-pripyat. Thank you.